Cronos Group isn’t the kind of company to promise the moon and deliver a pizza. That’s why the Toronto-based firm announced its intentions for a massive expansion after breaking ground on a 315,000-square-foot facility earlier this year. It’s all part of CEO Mike Gorenstein’s plan to be realistic with the company’s production targets. In fact, the new year will be marked by increasing separation between licensed producers able to execute their business plans and others caught with unrealistic targets. 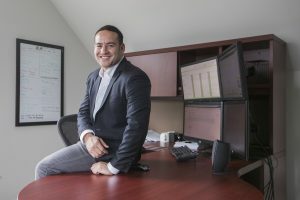 Cronos is based in Stayner, Ontario and traded on the TSX Venture Exchange as MJN. Gorenstein spoke with Marijuana Business Daily about product differentiation, the first day of legalization in Canada next summer and the status of Cronos’ new arrangement to grow medical marijuana in Israel. How do you make your 40,000 kilograms (88,185 pounds) of marijuana more appealing than the other 1 million kilograms on the market? I view our 40,000 kilograms as a premium product. Capacity is something you need, but what will ultimately separate the companies is the quality of the products that you bring to market. We spend a large amount of time and resources developing our intellectual property. Examples of IP include fine-tuning the ratios of cannabinoids and terpenes that form the API in a formulation to produce different effects using the entourage effect — having a cannabinoid-based derivative product that doesn’t make you hungry because it has a specific ratio of cannabinoid varins or breeding to develop unique genetics. Ultimately, intellectual property is what separates large agricultural companies from small farms – it’s not just a matter of who has the most farmland – what you can produce is more important than how much you can produce. With 80 licensed producers and another 460 in the works, will attracting capital get harder? As there are more licenses issued, people will care more about the business and people attached to the license. I don’t think there will be a capital crunch for everyone. There’s a certain tier that will always be able to get capital. But you have to execute, you need a unique strategy, you need a position in the market. You have to capitalize on your license to get more capital. Is 2018 the year “the big five” banks (Toronto-Dominion Bank, Bank of Montreal, Bank of Nova Scotia, Canadian Imperial Bank of Commerce and Royal Bank of Canada) get more involved in cannabis via lending? In the macro market we’re in, everyone’s starved for credit. But if you have a heavy cashflow business and you’re executing, banks are not going to ignore it. When the big five do get involved, you’ll see more separation the companies that are executing and the companies that are just promoting. Sophisticated lenders don’t read random blog posts. They do hard diligence. They make sure their investment is derisked. And, when you introduce traditional debt financing, you lower cost of capital and allow the companies to fuel their growth without dilution. It will make life easier for those that can access the debt and tougher for the companies that can’t. What’s holding back institutional investors? They’re waiting to see who is going to execute their business plans and do real valuations. We don’t know what the date is, but at some point they’ll feel comfortable enough and that the companies are mature enough to start investing. What will institutional investing mean for the industry as a whole? There will be more information. As things mature, people are going to start focusing on who is executing and who is not. It causes rationalization. It’s a move towards equilibrium. You can think of it as a reckoning — I can’t tell you if it’s 2018 or 2019, but I don’t think it’s much longer than that. You’ve got to execute. These valuations won’t stay lockstep forever. There will be a rationalization at some point. Right now, the question is which way will that go, and for who? Some companies will do extremely well from it, and some won’t. Think we’ll see more inter-industry investments in 2018 along the lines of the Constellation-Canopy deal? I think you’ll see more high-profile partnerships in 2018. The cross-industry interest is amazing. Both alcohol and pharma companies see the potential disruption to their core businesses. Whether they are making a defensive move, an offensive move or no move at all, just about all of them are deciding what to do and how best to do it. Where do you see opportunity for anyone on the outside looking in? If I were entering the industry right now, I wouldn’t be entering as a grower. I would put my resources into developing a product. By the time you get that product developed, it will probably be easier to get the raw inputs. How is rec going to unfold? Everything’s going to sell out instantly. It happens everywhere. Demand is always underestimated. That first day when the CCBO (Cannabis Control Board of Ontario) opens – people will line up to be able to say they were there the day that the first G-7 country legalized cannabis. It’s like if you have had five generations of iPhones, the iPhone X is being released, but – for no good reason – this was the first time the iPhone was actually legal. Can you give us an update on your Israel operations? We’re starting to get regulatory clarity on distribution and pharmacies. We expect to start putting up the structure for the greenhouse by the end of January. We have the electrical done and land cleared. The reckoning is coming alright! When the markets find out you don’t have a clue about growing cannabis…the reckoning will be at your door step. @TimHorton – I think you have the wrong gal, fella. One thing about Canada of note, they are high-tech in growing, but light years behind the USA when it comes to processing. Their extractions, edibles, concentrates, beverages, etc. are truly lagging behind. This is an area where some American companies such as edibles and extraction companies should get some licensing deals. Canada’s been mostly flower. Who is the best of breed in the extraction field, in the U.S? The CEO knows what he is talking about. Give him credit, in a very short time he has made great strides. International, local all going at a very fast pace. The separation from the competition is the key. I like how they plan on doing this. Also not by a lot of dilution of shares. If LPs don’t know how to grow cannabis then I ask – what have they been producing for the medical users? Cronos is executing on their plan every step of the way. They have positioned themselves to be a market leader internationally as the cannabis industry ramps up. I wonder what investors like Mike Gorenstein think of countries like Colombia, with a strong and millenary marijuana culture, that are legalizing marijuana production and encouraging legal trade. Are these countries interesting for their portfolios? Columbia like most South American countries has had a Cannabis presence for decades, illicit for sure. These countries (and native investors) would likely not be growing indoors or even within a greenhouse so as a source of ‘quality materials’, there may be a substantial gap there noting there appears to be little if any guidance on testing, reporting, etc. Those that we have spoken with appear to believe that due to low costs of outdoor cultivation and bulk extractions, they will have a strong export market opportunity which I would question as well. Access to capital has made the children rotten….they know not how they spend. Just another corporate trust fund fugazy.